Dr. Segal is an Allergist/Immunologist who sees both adult and pediatric patients. 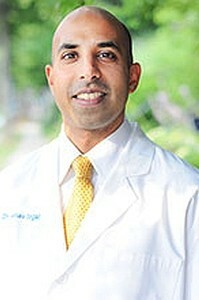 He is board certified by both the American Board of Allergy and Immunology and the American Board of Internal Medicine. He attended medical school at the University of Texas Health Science Center in San Antonio. He completed his residency at Thomas Jefferson University Hospital in Philadelphia, Pennsylvania and his fellowship in Allergy and Immunology at Creighton University in Omaha, Nebraska. Dr. Segal is a member of the American Academy of Allergy, Asthma, and Immunology, the American College of Allergy, Asthma, and Immunology, and the Joint Council of Allergy, Asthma, and Immunology. Dr. Segal is also affiliated with The Methodist Hospital-Thomas Jefferson University and Chestnut Hill Hospital. When he is not seeing patients Dr. Segal enjoys spending time with friends and family, reading, and painting. At last, let us WELCOME Dr. Manav Segal of Chestnut Hill Allergy and Asthma Associates to our Desensitization Directory, groups and hearts. Dr. Segal has decided to offer OIT and join the ranks of our Superhero Allergists. Dr. Segal was inspired by hearing the children’s stories and experiences with OIT. “It’s amazing how it has changed lives for many of them.” He appreciates the irony and complexities of once instructing patients to avoid the foods that can cause reactions to now asking them to do a “180” and trust that he can desensitize them. Anti-immunoglobulin e therapy. Segal M Stokes JR Casale TB; World Allergy Organ J. 2008 Oct . Expression and function of a novel variant of estrogen receptor-alpha36 in murine airways. Jia S Zhang X He DZ Segal M Berro A Gerson T Wang Z Casale TB; Am J Respir Cell Mol Biol. 2011 Nov .
Bid activation during induction of extrinsic and intrinsic apoptosis in eosinophils. Segal M Niazi S Simons MP Galati SA Zangrilli JG; Immunol Cell Biol. 2007 Oct .